With a few small pieces of my favourite Lotta Jansdottir prints left over from making cushions, I had the idea of patching them together to make a little modern runner for our dining table. The scraps were arranged, sewn together... but then, as I laid it out, unfinished, on the table, the very thought of crumbs and curry and bolognaise and all the rest of our eating-time mess and mayhem splattering on these delicate little prints, the plan changed. The table runner grew and grew, using up the few larger pieces of Lotta fabric I had, plus a couple of Justin's shirts, of course, and some long solid panels along the sides. It grew to be an over-sized twin-sized quilt (large enough to cover our guest bed completely, so that it doesn't look too blanekty in the day, but can be slept under at night). As the guest bed is in what will be the new baby's room, I like to imagine having this nice big quilt to cuddle up with/collapse under during the long winter nights of newborn nighttime fun. The calming colours -- greys, whites, a touch of turquoise -- seem perfect for creating a little calm when sleep is in short supply. It'll be a Lotta sleep, if not a lot of sleep. Deadline: December. 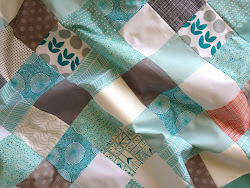 Though we'll see if I can keep myself from using the quilt before that -- how nice it would be to save it as a special you've-just-had-a-baby treat, but then what a waste of cosiness to leave it unloved for all those months! Oh it's lovely and you were quite right not to let it get food splattered. If you can resist, you will have two special treats to look forward to in december! 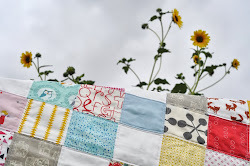 Great colours, will you show us the entire quilt please?